A grant from the National Development Agency (NDA) is taking a group of 10 young men and 30 women from poverty and dependency to independence and entrepreneurship. The NDA grant of R790 000 is helping this group of young entrepreneurs to create jobs through supplying bread from their bakery to the local community. The grant is also helping them to improve their business skills through specialised training. Some of the money from the grant was used for skills training at the local DWT Nthathe Mercy Skills Training Centre. The rest was used to buy a delivery van and some much-needed equipment for the bakery. 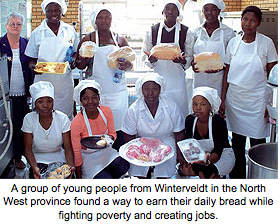 The bakery was started to fight poverty in the area by creating jobs and supplying affordable bread to the community of Winterveldt. 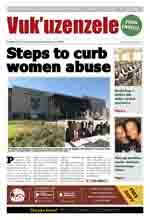 It also supplies spaza shops and women selling at schools with fresh and affordable bread. The 15 women selling at schools are making a living and are able to feed their families as there is a regular income. The NDA said they were proud to see their efforts and resources being put towards a successful project like the Manna Bakery. They hoped that the young people who received training would share their knowledge and experience with other people who are in need of skills in order to survive.